Since getting the copper coil (TMI alert), I've been suffering for a few days each month with mild-medium period pain. Before opting for this (rather invasive) contraceptive solution, I was always warned that my periods might be heavier and more painful than before, despite not emitting any additional hormones into my body with this completely hormone free option. Though, thanks to Livia, I have finally found THE ANSWER to period pain.. and trust me, you will THANK me forever for discovering this! 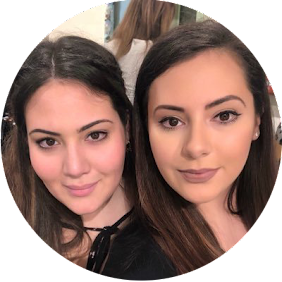 Having been with my now-husband since I was 18, and suffering from horrendous period pain since I was a young teen, I've always been on some sort of contraceptive, but getting to the 'right' one has been quite a journey. Since I was about 16/17, I've basically tried every contraceptive possible - several brands of the combined or oestrogen/progesterone only pill, the implant, the patch and now the coil. With a few different strains of the big C in the family, I've always been wary of the side effects additional hormones could have on my body - not to mention the changes to my mood, appetite, weight etc. So it was important to me to find one with as little hormones and risk to my health as possible. After enduring years of hormone-emitting options, I did more research and spoke to my GP about my increased risks of cancer and decided there was only 2 options I had left.. an IUD or no contraceptives at all. Concerned about the length of time my periods now lasted because of the patch, I looked further into the IUDs and discovered there are two types - an hormonal coil and the copper coil. Without a second thought I booked an appointment to have the non-hormonal (copper) coil inserted. I won't go into detail about that.. but I'm just saying it was as unpleasant as a smear test, but overall, totally worth it. The copper coil can last up to 10 years but can be removed at any time, immediately resuming you to normal fertility. The copper basically stops sperm from getting near your eggs, without any need for oestrogen or progesterone. It's one of the best decisions I've made as I never have to worry about missing a pill or forgetting to change my patch, or worrying that at any minute my mood is going to change and end up verbally hurting a friend or relative with my random bursts of anger I experienced as a result of the implant. I've had the coil in since November 2016 and since then my periods have only lasted 3-4 days (they're heavier, but shorter) with 1-2 days of pain before/during. My moods are back to normal and wholly in my control, I can now only blame by lack of self control for my weight gain and I'm safe with the knowledge that there'll be no accidents'. Having been married for over a year now and moving into our house in less than 6 weeks, a baby isn't on the cards YET but it's great knowing that when we do decide to make that leap, we can start trying the day after I get my coil removed and don't have to wait several months for my fertility to return to normal as you would with the pill. Last year, I had the worst period pain of my life, which I mistook for a stomach ache following a dairy binge and had to call in sick to work to curl up on my bed and feel sorry for myself *insert period gif here*. Scrolling through Instagram, I came across an ad that really resonated with me, and for the first time, I clicked the link. Discovering Livia* was honestly the best thing I could have ever done and I will thank myself for it every month until I hit menopause. 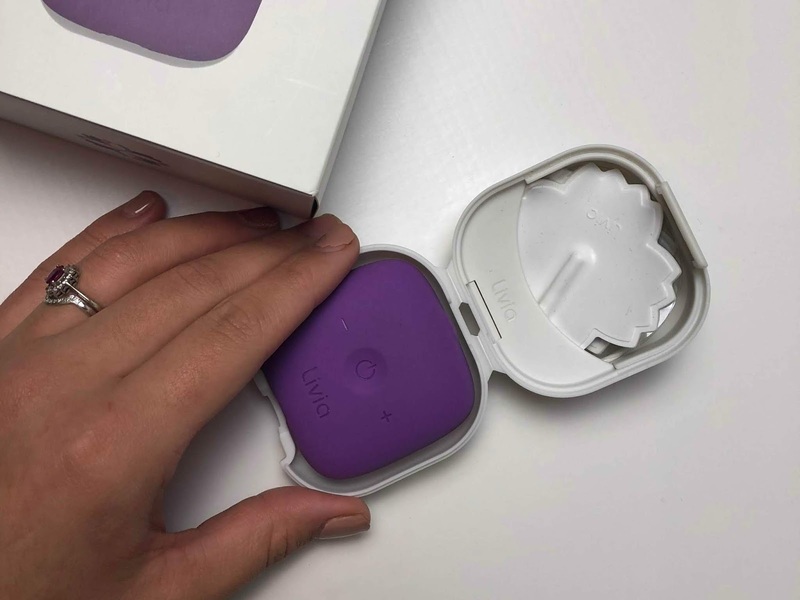 The ad was an edit of numerous YouTube reviews of this little square device that connects to little sticky pads you put on your lower abdomen, they boasted about it completely curing their period pain each month. It really struck a nerve with me and I knew I had to give it a try. This incredddddible little device promises to literally zap away your period pain, allowing you to go about your day as usual, rather than being curled up with hot water bottles and painkillers. Essentially, it's a TENs machine, like the ones you'd use during child labour, that send electrical pulses where you feel pain, to numb/interrupt the pain signals that are being sent to your brain. This period pain killing device can be cranked all the way up depending on how bad your pain is, and is one of those investments that you'll see the fruits of immediately, and will last for years and years. Whether you suffer from mild cramps, extreme menstrual pain or from endometriosis, the device will result in significant pain relief. It's been dubbed 'The off-switch for Menstrual Pain'. The battery is rechargeable and can last all day at the highest intensity and only takes a few hours to charge up, so there's no worry that you'll be without when you need it. 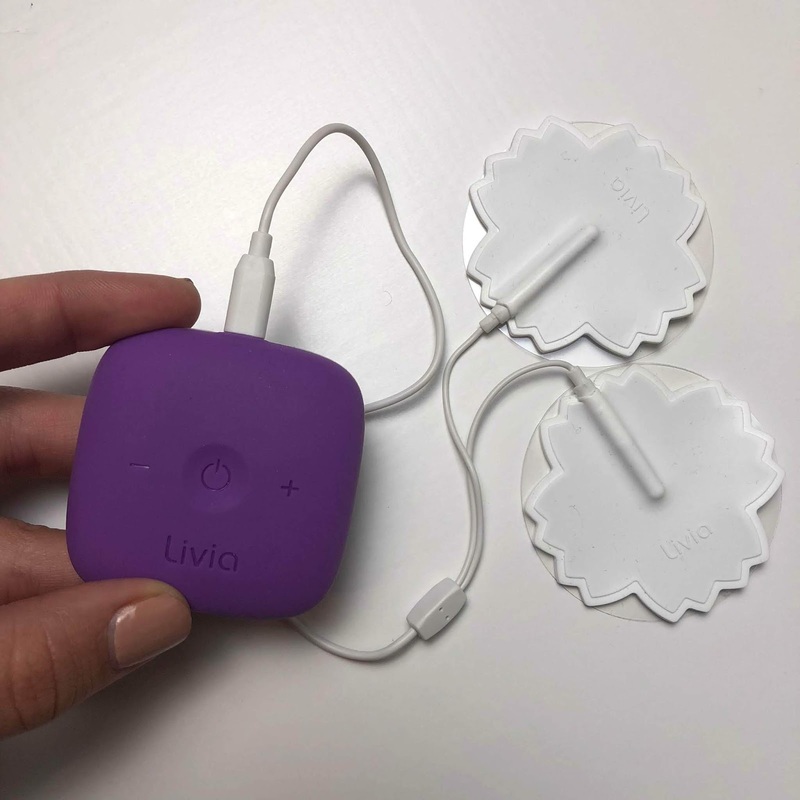 As part of the kit, which is currently on sale with 20% off (Sept '18) at just £129 (usually £149) you get the main Livia device with your colour choice of classic silicone cover, two Livia flower pads with 1 month's Gel Pad already attached, 3 months supply of replacement Gel Pads and the USB charge cable, travel case and a 2 year warranty (as well as a 120 day money back guarantee!). Almost a year has passed since receiving the device and I'm still on my first set of gel pads. The adhesive lasts time and time again so you don't actually have to change them every month, a simple wipe with a wet tissue can keep them clean without losing their stickiness and you can just replace the plastic protector discs for the next time you use it. The handy travel case allows me to keep it in my bag at all times for those emergency situations where the pain just comes at you with full force. When do you eventually run out of gel pads, replacements are just £25 for a 6 month supply (more like 6 years for me) and if for whatever reason you need new Flower pads, they're just £22 too. You can also accessorise your device with a variety of coloured and textured skins, but really, only you will see it clipped on to your waistband. Okay, so let's do the math..
Say you have periods from around age 12 and the average age of menopause is 51, that's 39 years of use if you buy it when you first start. At full price, that works out £3.82 a year, or 31p(!!) per month, just for the starter kit. If you do use one sticky pad per month rather than making one last like I do, and need the replacements, that also only works out as £4.16 per month, totalling £4.47 per month for everything - that's less than your monthly spend on painkillers! Definitely a worthwhile spend, especially when shipping from the US is free! Not to mention, it's a completely natural, drug free solution to period pain, meaning you can do without painkilling medication and hot water bottle days every month. It provides instant relief at the click of a button and is super discrete so you can wear it all day, at work and at the gym. Applying the device is really easy, you just plug the flower pads into the device and peel off the plastic cover of the sticky side. You then have to place one flower either side of where the pain is, not too far from each other and clip the device onto your waistband or wherever is discrete enough for you. Then press the button in the middle and crank up or adjust the strength with the + and - buttons depending on how bad your period pain is. I usually keep it on for about 6 hours then give it a little charge so I can wear it overnight. When the pain gets a little more intense, I turn it up, when I can feel my muscles spasming, I turn it down. The sensation is like a little electric pulse, like a tiny electric shock. It doesn't hurt at all, just feels a bit weird. Like a fuzzy sensation, but it really does its job of blocking the pain signals from your uterus to your brain. It doesn't just work for period pain either, I've used mine for back pain, headaches, neck aches and stomach aches. As a TENs machine, you can pretty much use it during child labour too, but you might want a proper one that has more connectors for that though. Overall, it's an invaluable purchase and you honestly wouldn't regret it! If you did, you still have a 120 day money back guarantee, so you've lost nothing if it just doesn't work for you. I've already recommended this device to numerous friends who have all made the investment and are now switching off their period pain each month, and like me, couldn't imagine life without this magic gadget going forward. You can get yours here! 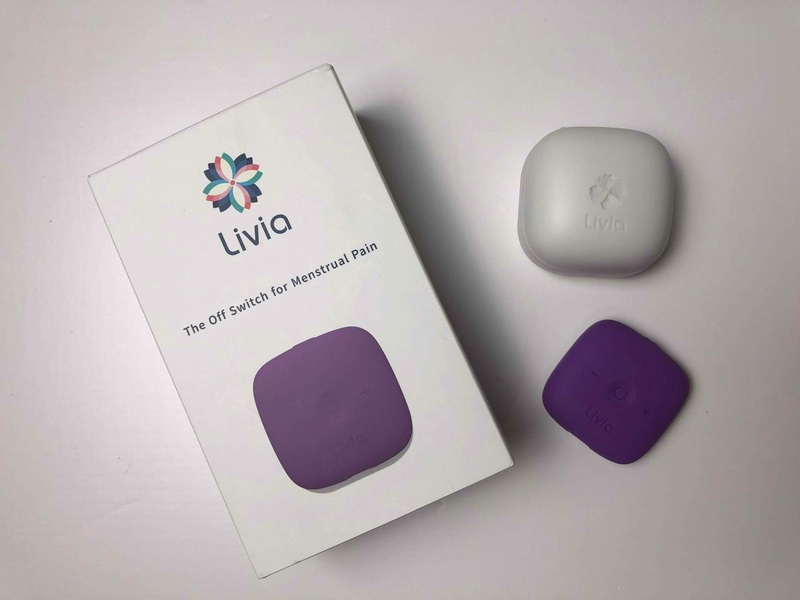 *disclaimer* I contacted Livia asking to collaborate after I had seen the device on their website and they very kindly gifted me their device to try out. All views however are my honest truth and gifting has in no way altered my opinion or experiences with this product. I was going to buy this product for myself and will continue to recommend it to those who suffer from period pain. We do not get payment for referrals or link clicks.